Diagram below shows the methods of extraction for different metals. 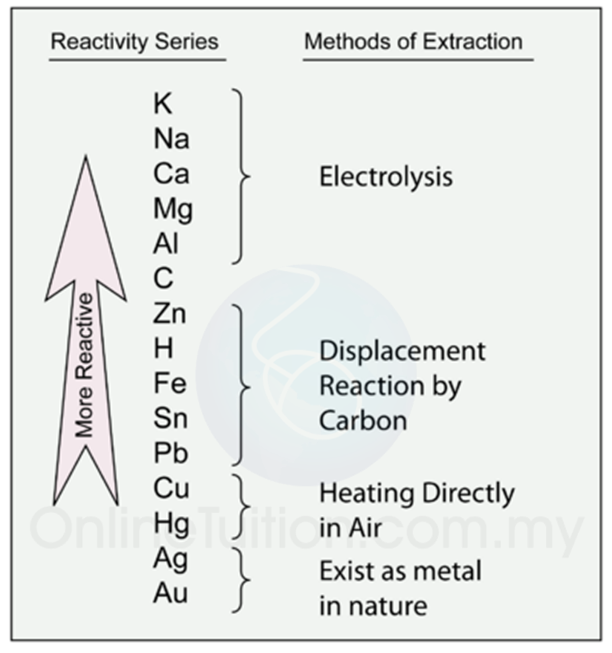 Metals which are less reactive than carbon in reactivity series are extracted from their ore by displacement reaction using carbon. Copper and mercury can be extracted from their ore by burning directly in air. Silver (Ag) and gold (Au) need no extraction because they exist as element in nature. Those metals which are more reactive than carbon are extracted by electrolysis. Figure above shows the illustration of the designed used to extract sodium in industry by using electrolysis. The negative chloride ions are attracted to the anode and then discharged to form chlorine gas. The sodium ions are discharged to form sodium atom. Due to high temperature, the sodium metal formed is in molten form. Metal sodium have lower density. Therefore it moves upward and been collected. Figure above shows the illustration of the designed used to extract aluminium in industry by using electrolysis. why cryolite is added into molten bauxite in the process? At the anode, oxygen gas which also has commercial value is collected. The aluminium ions are attracted towards the graphite cathode. The ions is discharged and become molten aluminium metal. Q: Explain why cryolite is added into molten bauxite in the process? A: To reduce the melting point of bauxite. Q: Explain why the carbon electrodes need to be replaced periodically. At the temperature of 980 °C, the oxygen burns the carbon anode. Also, this cell uses large quantities of electricity, and therefore needs cheap sources of power. Note: The anode is then made of the metal we wish to plate with (copper), and the electrolyte needs to be a solution of a salt of this metal (copper(II) sulphate). Copper is a good electrical conductor and is used extensively to make electrical wiring and components. However, the presence of impurity in copper can reduce its electrical conductivity. In industry, electrolysis processed is used to purify copper, and the process is called electrolytic refining. Figure above shows the illustration of the apparatus setup to investigate electrolytic refining of copper. 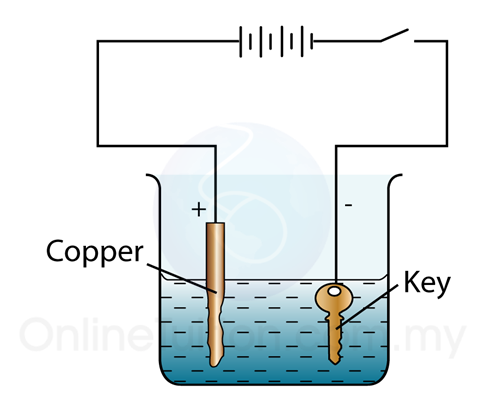 When electricity flows, the copper in the impure anode dissolves in the solution to form copper ions. Copper ions are then deposit on the cathode which consist of a piece of pure copper. 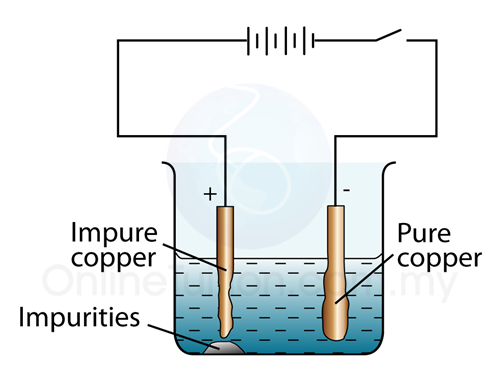 Note: Impurities in the copper do not dissolve, and instead fall off the anode as anode sludge. At the cathode, the copper ions are deposited as pure copper metal.